Well, for this installment of WIP Wednesday, I'm going back to a neglected project. I've been neglecting my *Persian Dreams KAL blanket for way, way too long. I've (still) only got two hexagons done. Pattern is the absolutely gorgeous Persian Dreams pattern, by Jenise Hope, and the KAL is being run by the good folks at *EatSleepKnit. 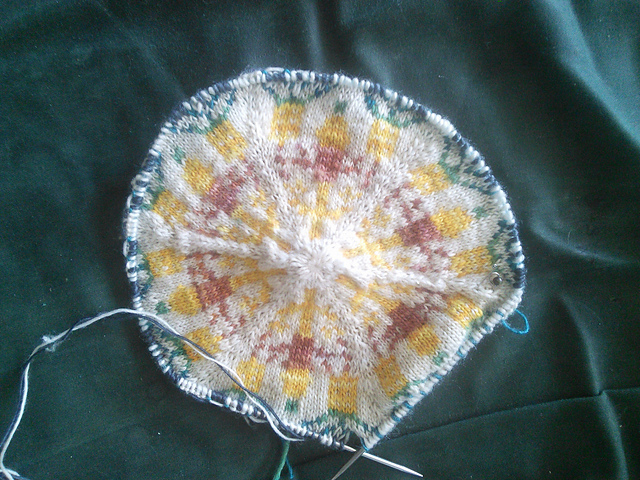 But, I'm taking some time away from a third Snowdrop Cowl (it looks just the same as the last one right now, but in green instead of red), to work on another hexagon of the of the blanket. That brings me to 3 of 24 hexes, with lots to do before the end of the year! I'm not sure if I can pull it off, but I can try, right? Yarn is a*Manos del Uruguay's Fino, in a variety of colours. Colours so far for the Hexagon in progress are "Gaslamp" (Yellow), "Pocketwatch" (Red-Orange), "Wardian Case" (Green), "Peacock Plume" (Teal), and "Mourning" (Navy Blue), with the background being "Ivory Letter Opener." All that said, the pattern is actually really awesome. The only thing that's not immediately clear about this pattern so far is how to do the border. Some of the hexes have a a knitted-on border on some sides (depending on where in the blanket that hex will go.) That part's fine and makes sense. But I'll admit to being a bit confused as to how, exactly, to sew up the border. The hexes are grafted together, but the border is sewn. I'm hoping and assuming it will make more sense once I actually get to that point. I'm doing my version in a whole bunch of matching, purpose-bought colours, but it's occurred to me this would also make an amazing stash-busting blanket, and be a great way to use up those sock yarn scraps that most knitters seem to have! Anyway, that's this weeks WIP, and I hope you enjoyed! Patreon Update: New Goals, New Rewards!